February 18th, 2010. Those strangely calm, hot days of California’s mid-winter, which are stabilized by high pressure systems, were coming to an end. Thus claimed our VHF radio’s weather forecast, with NOAA’s machine-voice: “South-east winds 20-25 knots, thunderstorms and rainshowers.” Translation: storm coming in 2 days. True enough, night-time temperatures had been “chilly” in the low 50s, sometimes upper 40s, but day-times were gorgeous. Alyssum and I had been snorkeling in the kelp beds (which look like backlit Sequoia forests swaying dramatically in the wind); we had hiked in the hills and nibbled on prickly pear cactus (very carefully); and kayaked into big sea caves that gurgled and made a decent stab at capsizing us with sudden nearly-breaking surges. In strategic anticipation of the nasty conditions, we sailed from Fry’s to Pelican’s, which is one of the popular summer anchorages, but we only had to share it with one 50-ft research dive sailboat. The owner was an ex-urchin diver and now collected special fish specimens for university labs. His motor-sailor had big tanks of water with the valuable fish critters. Pelican’s is a real treat. The anchorage is calm. There are ruins of an old house/hotel, and neat coves to investigate by kayak. 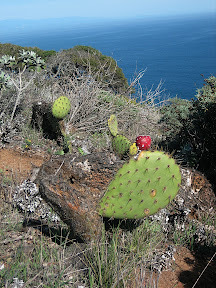 The hike to Prisoner’s Harbor is stunning in terms of flora, scenery, and the island foxes that scurry about. In the evening, with approaching rainclouds looming close, we took the Aldebaran to “weather the storm” at Prisoner’s, figuring it would be in the protected lee of the strong south-east wind. A 34 foot sailboat was at anchor with four guys clad in foul-weather gear, which they chartered on their own. Crowded and rolly… That night, the rain came down in sheets, the rigging howled, and the sea was lumpy but fine aboard the trimaran’s stable footing. Huddled underneath blankets with the wood-burning stove crackling, we made sun-dried tomato and garlic pizza and watched a movie on the laptop. Cozy! The stormy night was not only uneventful, it contributed to the overall romantic atmosphere. I was emboldened by my decisions as skipper– there had been consideration of returning to Santa Barbara due to this storm, which I had waived off non-chalantly –and thought we should do part of the hike leading towards Scorpion Bay, in the east side of the island. Here is where my calculations went astray. 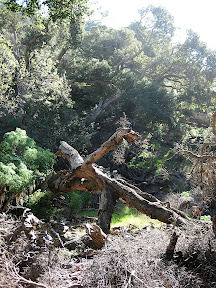 I was unwittingly having quite a nice time hiking in the fresh post-rain air; walking by the campers at Del Norte Campground giving them an attitude of amusement and mild contempt (due to my sense of deranged superiority — I had, after all, spent that soggy night in a comfortable yacht); without realizing the notorious clearing winds of the North-west had begun howling. Prisoner’s Harbor, safe anchorage until the winds shift. Rapidly. Nay, I’ll be frank– the gale winds had shown evidence of manifesting already that morning. As we paddled the dinghy to the pier before hiking, the horizon was a shaky mess. Yet I misjudged and upon return it was howling goats. Luckily we had a downwind run in the dinghy (our soaking would have been three-fold, if it had been anything else), and the anchor had re-set magnificently to account for the now windward shore. That is, a wind that is blowing the vulnerable vessel directly towards the unmerciful tentacles of rock and beach. Thus humbled, the skipper led a quick escape and set sail, in the only direction possible, or at least desirable, which was downwind and towards the east end of the island, where we hoped to find shelter.